FTD Featured in Angie’s List Magazine! 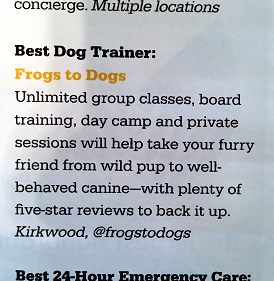 Frogs to Dogs is featured in the upcoming issue of Angie’s List Magazine in the article Training tricks! Click here for a sneak peek (pdf)! FTD Wins Best Dog Trainer 2013! Frogs to Dogs wins Best Dog Trainer in Jezebel’s Best of Atlanta 2013! So is all this doting a problem? Is there any harm in treating our pets like children? Andrew Zbeeb, who owns the pet-training and sitting company Frogs to Dogs in Atlanta, said pet pampering is usually harmless. But it can turn potty training and overfeeding into big problems, Zbeeb said. FTD Featured on The Weather Channel! Frogs to Dogs in the Weather Channel feature “Can Dogs, Cats Predict the Weather? Lulu and I have had our share of training issues, from mastering the down command to heeling during walks. Lulu may be 7 years old, but she’s still learning new skills. Whether you have a puppy or an older dog, it’s never too late to tackle basic commands. I asked professional dog trainers to share the most prevalent behavior issues, along with solutions. You may have read about the top five most common problems. Here are five more predictable issues and tips for overcoming them. FTD Featured on CBS Atlanta! Our own Amy Jackson interviewed by CBS Atlanta for her documentary covering Operation Second Chance, pairing shelter dogs with inmates. Nothing says fun like a frisky, frolicking pooch on the go. But sometimes we need to curb all that infectious energy and get our dogs to sit, stay and remain calm. If your dog is recovering from an injury — or you’ve simply run out of ideas for fun on rainy days, try these low-impact suggestions to keep your pooch moving. FTD on Mother Nature Network! Before you open another container of turducken, pop open a can of Irish lamb stew or fork out a hearty helping of chicken de-lite for your beloved dog or cat, you may want to stop and read that pet food label a bit more carefully. Unfortunately, our love affair with over sized portions has trickled down to the pet set, resulting in a mountain of veterinary bills for familiar ailments such as diabetes, heart disease and joint-related issues. Read the entire article on mnn.com. Kirkwood resident and lifetime animal lover Andrew Zbeeb started his dog-centric company Frogs to Dogs seven years ago and moved the business to 2006 Hosea Williams Drive in 2008. Offering positive, non-confrontational dog training, pet sitting, and pet transportation via the city’s only pet emergency vehicle, the Atlanta Animal Ambulance, Zbeeb has garnered quite a following in Kirkwood and nearby areas. To read the article in its entirety click here (JPG).